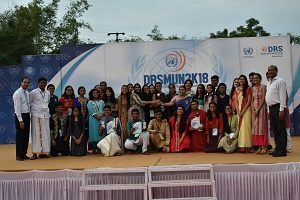 DRS International School hosted its 6th Model United Nations Conference, the DRSMUN2K18 from the 23rd to 25th of August, 2018, at the school’s campus. 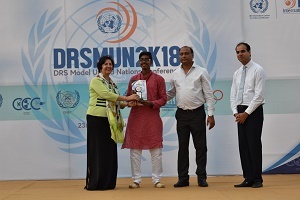 A highly anticipated event in the student community of Hyderabad, the conference saw nearly 400 participants from across 35 schools in attendance. 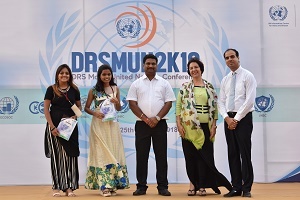 The school has associated with the United Nations Information Center for India & Bhutan (UNIC) to make the conference as realistic a simulation as possible of actual proceedings. The three-day student-event began with an opening ceremony, inaugurated by Mr P. Anand Kumar, IRS, the Additional Commissioner, Hyderabad, GST Commissionerate. The eight committees and panels at the conference had agenda that ranged from those with regional significance such human rights violations along the Line of Control, to those with global significance such as measures to manage the rapid deterioration of the Arctic Region, and the rise of cryptocurrency. The committees saw intense and stimulating discussions over the three days that gave students hands-on experience of discussing, caucusing, drafting, deliberating and voting on resolutions. The school’s Directors,Mr A K Agarwal, Mr Sanjay Agarwal and the other dignitaries present, gave away the awards to the participants at the grand closing ceremony held on the evening of the 25th . Besides awarding the best delegate, the best photo-journalist and the best reporter, the school also recognized delegates for their representation with High Commendation, Special Mention & Verbal Mention in the conference. Committee Chairpersons and Vice-Chairpersons were also applauded for their expertise and for steering the committees ably. “MUNs such as the DRSMUN2018 are amazing platforms to recognize the power of student leaders as change-makers,” said Ms Janet Fainaian, President, DRSMUN, taking cognizance of the diligence of the Executive Board and the delegates.